A year's worth of gas at today's prices could easily cost $1,265 more than last year. What do you do? HUNT VALLEY, Md. (TheStreet) -- Only a year ago, gas prices nationwide were at manageable levels. At $2.85, the average U.S. household -- according to government figures showing purchases of a little over 1,100 gallons of gasoline per year -- was spending $3,135 annually. Even with a slight dip in oil prices that followed news of Osama bin Laden's death, a year's worth of gas at today's prices could easily cost $4,400 -- an additional $1,265 per year, or $105 per month. Not exactly pocket change. And we must consider that some analysts are predicting a near certain $5 per gallon -- an estimated $2,365 more than last year, or $197 more per month. 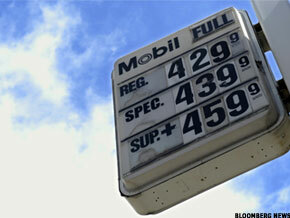 A year's worth of gas at today's prices could easily cost $4,400 -- a jump of $1,265 from last year. Consumers' budgets have to make up for that. Oh, did I mention the cost of the average American summer vacation is $1,600? What do you think will give? What can you do? It's better to ask what you will do, because you have little control over U.S. energy policy, but some control over your income -- and complete control over your spending. The No.1 indicator of a healthy financial household is its cash flow mechanism. This means managing the present by analyzing your actions in the recent past and predicting them in the near future. Some call it budgeting, but since that term has a tendency to draw as many readers as a detailed report of a colonoscopy, we'll call it "margin management." Businesses without profit margin fail. Why would we expect any different of our household finances? Margin management just means deliberately setting aside funds for the unexpected, which is simple, but not easy. (Check out this hysterical Saturday Night Live skit, "Don't Buy Stuff You Cannot Afford.") It's basic math, but behavioral management (especially our own) is horribly challenging. We must set aside money today (which we'd like to spend) for future expenses (for which we'd prefer not to pay). Each virtual envelope in our cash flow system should be filled with an amount slightly beyond our typical expenditures. Then we should have a distinct category labeled "margin" or "buffer" or "slush." My two favorite tools for margin management are Mint.com and YNAB.com. Mint is the best free online personal finance tool I have seen. It aggregates all of your accounts and does half the work of margin management for you. YNAB stands for You Need A Budget ("You Need A Margin Manager" just didn't have the right ring to it, I guess) and is a software-based tool with a $59.95 price tag. It's nothing short of a life-changer for those who dedicate themselves to its precepts and process. Last night, for the first time since college (the '90s), I put less than a full tank of gas in my car. I'm not going to lie; my pride took a hit. But I completed the last leg of my journey home satisfied knowing I kept within the confines of my car expense budget for the month. Timothy Maurer, CFP, is vice president of Financial Consulate, based in Hunt Valley, Md., and a member of NAPFA, the National Association of Personal Financial Advisors. He can also be found at TimMaurer.com.